For almost a century and a half, Bulfinch's Mythology has been the text by which the great tales of the gods and goddesses, Greek and Roman antiquity; Scandinavian, Celtic, and Oriental fables and myths; and the age of chivalry have been known. The tales are eminently readable. 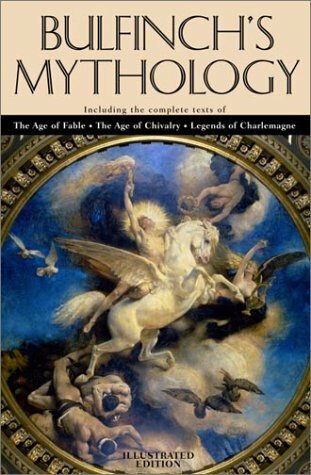 As Bulfinch wrote, "Without a knowledge of mythology much of the elegant literature of our own language cannot be understood and appreciated. . . . Our book is an attempt to solve this problem, by telling the stories of mythology in such a manner as to make them a source of amusement." Thomas Bulfinch, in his day job, was a clerk in the Merchant's Bank of Boston, an undemanding position that afforded him ample leisure time in which to pursue his other interests. In addition to serving as secretary of the Boston Society of Natural History, he thoroughly researched the myths and legends and copiously cross-referenced them with literature and art. As such, the myths are an indispensable guide to the cultural values of the nineteenth century; however, it is the vigor of the stories themselves that returns generation after generation to Bulfinch. This book is in Electronic Paperback Format. If you view this book on any of the computer systems below, it will look like a book. Simple to run, no program to install. Just put the CD in your CDROM drive and start reading. The simple easy to use interface is child tested at pre-school levels. Windows 3.11, Windows/95, Windows/98, OS/2 and MacIntosh and Linux with Windows Emulation. Please be aware that there are many editions of this book. The original text dates to 1855. The only volume with which I have been involved--and which, naturally, I consider the best--is the 1991 HarperCollins hardback for which I provided a long introduction and scholarly notes. Apparently many reviewers on this site have been sold inferior editions by earlier editors, still circulating.